Whiskey and Chocolate at Reserve 101. Photo Courtesy of Christine Lee. For traditionalists, we have a list of Houston’s most fun and most romantic dinner events for this Valentine’s Day. However, this year it falls on Wednesday, a.k.a. “Hump Day”—and with that in mind extra emphasis on the libations might be quite welcome. Here are a few places around town ready to help you be someone’s boozy valentine. Anvil Bar & Refuge, 1424 Westheimer: For the last two years, one of Houston’s foremost craft cocktail bars has drawn the curtains, turned up the music and lit the candles for a night of boozy yet sophisticated romance. This year is no exception. Guests are greeted with Champagne (and roses) then can select two cocktails from the special Valentine’s menu. For a fitting ending, lovebirds can select a pour each of spirits from a bar cart full of rare temptations. The cost is $75 per person and reservations must be made in person at the bar during regular business hours. Axelrad Beer Garden, 1517 Alabama: Craft beer lovers have their own ideas about romance. So, Axelrad (which includes a huge yard and hammocks) is tapping special brews this Wednesday that feature chocolate and fruit notes: Left Hand Milk Stout, Lindeman’s Strawberry and Framboise, Deep Ellum Play Date, Deep Ellum Cherry Chocolate Double Brown, Odell Friek and Great Divide Strawberry Rhubarb. For those who want to ring in the boozy holiday without the hops, they are also serving Stupid Cupid, a cocktail made of Chambord, rose water and champagne. Better Luck Tomorrow, 544 Yale: Why wait till Wednesday when you can celebrate “Tinder Tuesday?” Inspiration for this dating app “holiday” was that the “L” in Luck in this bar name seems to get swapped out often for, um, something else. To commemorate a whole bunch of bad first dates, “Better *uck Tomorrow” is serving an Olive Garden-inspired lasagna and the bar staff is unveiling specialty cocktails for two. The cacio e pepe regularly served on Pasta Night Tuesdays is also available. Antipasto and Wine. Photo Courtesy of Grimaldi’s. 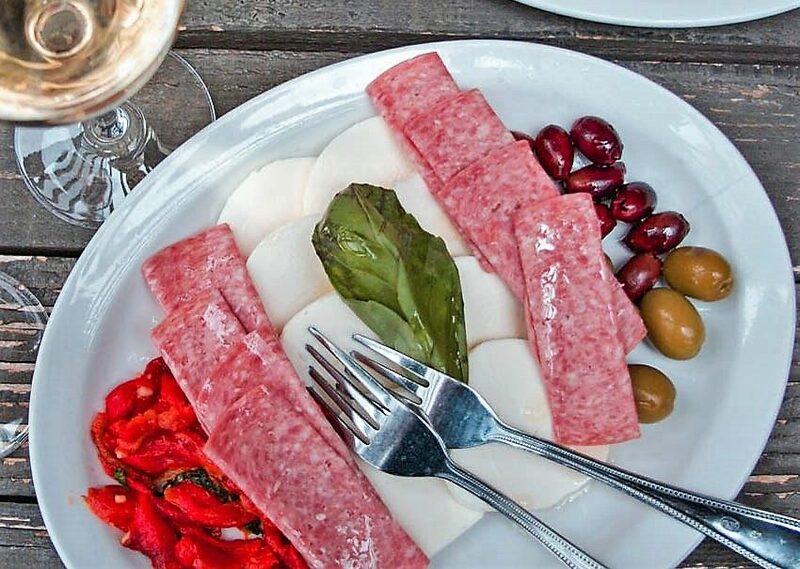 Grimaldi’s, various locations: For a budget date that’s not short on the liquids, get a bottle of wine for Valentine’s Day alongside a shareable appetizer. This Wednesday, all Grimaldi’s locations are offering Kendall Jackson Avant Chardonnay or 6th Sense Syrah paired with a bruschetta trio or small antipasto platter for only $25. Izakaya, 318 Gray: If you love people who love whiskey more than most other people, Izakaya‘s “Whiskey Is My Valentine” event this Wednesday might be just the thing. It’s held in their Mural Room and starts at 6 p.m. offering patrons a selection of Japanese whiskeys, a photo booth, sweets and appetizers from chef Jean-Philippe Gaston. Molina’s Cantina, all locations: Not in the mood to go out? The folks at Molina’s Cantina are offering a “Cupid Combo” to-go until the 18th. The combo includes beef and chicken fajitas with sides, four Cancun shrimp, a whole grilled quail and slice of tres leches cake, all for just $49.95 plus tax. At home, just add tequila. Of course, patrons can opt to dine in and have someone else make the the margaritas. 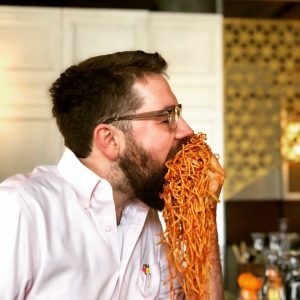 Justin Vann, sommelier and co-owner of Public Services Wine & Whiskey, proves he loves red-sauced pasta more than his shirt. Photo Courtesy of Public Services Wine & Whiskey. Public Services Wine & Whiskey, 202 Travis: Public Services is treating Valentine’s Day like the Holiday That Must Not Be Named this year. However, they are also marking the date with “Red Sauce Night” this Wednesday. Featured are spaghetti and meatballs prepared by chef Justin Yu (also of Theodore Rex and Better *uck Tomorrow) paired alongside some of the staff’s favorite Italian libations, wines and beer. Prices vary depending the order and doors open at 4 p.m. Until recently, the bar only offered pre-measured cocktails, but it’s changed over to freshly shaken ones served alongside the vast inventory of wine and whiskey. 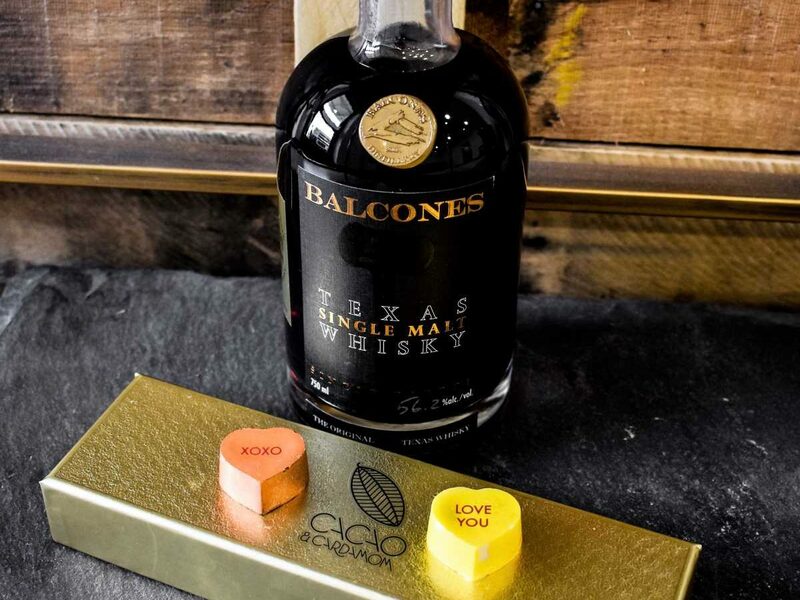 Reserve 101, 1201 Caroline: Who doesn’t love a good chocolate from Houston’s Cacao & Cardamom, especially when it comes paired with a tasting of four whiskies from Balcones Distilling. Well for $75, you can enjoy both at Reserve 101 this Wednesday night with two seatings at either 7 p.m. or 9 p.m.
Tongue Cut Sparrow, 310 South Main: Romance and booze is in the air at Tongue Cut Sparrow. The hideaway located above The Pastry War is featuring a special menu of cocktails inspired by romantic getaway spots from around the world. So, if you can’t get away, you can still drink away—along with hot towel service and complimentary bar snacks. If all else fails, make your own boozy valentine at home compliments of your local liquor store and cocktail recipes from the Internet. Enjoy, remember to imbibe responsibly and be sure to use Lyft or Uber as needed.